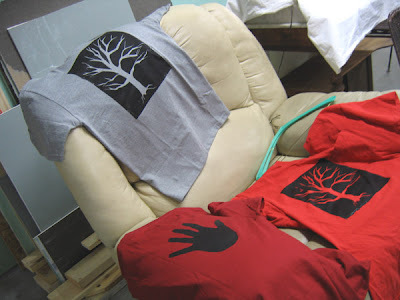 Last night, my teacher friend, Debbie, and I had a practice silk screening session in her garage. She is having her art classes do an interesting project between the Dixon Schools and the art gallery, The Next Picture Show, in town. The kids will learn how to do simple silk screen projects on clothing and accessories, then do a fashion show at the gallery on an opening night (for another art show) in February! Since neither of us had done silk screening in maybe over 30 years, we thought it wise to practice and see what the pitfalls might be with a bunch of 5th and 6th graders! Besides the cold temperature in the garage (even with a space heater), we had a good time playing with the ink and figuring out how much to use and how elaborate a design we can get away with for quality prints. The picture at the top are some of the finished t-shirts. Not bad for a couple of neophytes in silk screening. Oh, yeah, Debbie sent a call out to other schools outside of Dixon for the use of any silk screens, brayers, etc., and you should have seen the immediate response of other art teachers willing to loan equipment and even delivering them for this project. Thank you everyone!